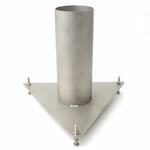 The 255-205 Stillwell is a stainless steel tube with a triangular base for stability. 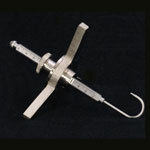 It is placed in the evaporation pan to support a fixed point or hook gauge. The stillwell (or stilling well) makes readings more precise by eliminating wind-caused surges and ripples in the water level. The 255-205 Stillwell is a stainless steel tube with a triangular base for stability. It is placed in the evaporation pan to support a fixed point or hook gauge. The stillwell (or stilling well) makes readings more precise by eliminating wind-caused surges and ripples in the water level. It has two small openings located opposite each other near the base to permit the flow of water in and out of the stillwell.